Introduction – Haralhalli is a small village on the left bank of Tungabhadra river. In 1881, its population was mere 129. Bombay gazetteer refers the village as Haralhalli while Dharwad gazetteer refers it as Haralahalli. It now comes under Haveri district and the officially referred as Haralhalli. Google maps has listed it as Haralahalli located near Guttal. The town is referred as Gottamgadi in inscriptions, it would be interesting to find out that how Haralahalli came into vogue from Gottamgadi. Though now reduced to a small village, it would have been an important town in medieval times. The earliest inscription found here refers to the rule of the Guttas of Guttal. Their ruler Vikramaditya II was ruling under the patronage of the Western Chalukyas. The Guttas were ruling from Guttavolal (modern Guttal) which is not very far from this village. In comparison to Guttal, Haralhalli seems to have more antiquities. Monuments – Bombay Gazetteer mentions three temples in town, that of Someshvara, Kaleshvara and Udchamma. Someshvara temple is standing in its full glory, except little damage to its main shikhara. 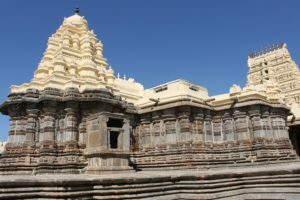 Udchamma temple is a live temple of not much antiquity. Kaleshvara temple might be another triple-celled structure standing north of Someshvara temple. This is referred as Chikkeshvara temple in inscriptions. Inscriptions mention two more temples, that of Daseshvara and Tulvaleshvara, however these are not traceable now. Someshvara Temple – This temple is triple-celled (trikuta) shrine having three towers intact. The main shrine is on west, the subordinate shrines are on south and north. Originally it was a single cell shrine dedicated to swambhu (self-originated) God Someshvara. During the rule of the Gutta king Joma II, in twelfth century CE, this single celled structure was converted into a triple-celled shrine on order of the then Kalamukha priest of the temple, Kalyanashakti. Joma II added two more shrines, one on north and one on south, and dedicated those to Vikrameshvara and Gutteshvara. Both of these were dedicated to his predecessors, Vikramaditya and Gutta. Though it is not specified whether northern shrine is for Vikrameshvara or the southern however it is not that hard to identify. Vasundhara Filliozat tells that Vikrameshvara is name of Vishnu and in accordance with the Kalamukha concept it should be enshrined in the northern cell. In this manner, the southern cell should be enshrining Gutteshvara. Antarala (ante-chamber) doorways are provided with perforated windows. The lintel of the west shrine shows Ganesha, Brahma, Shiva, Vishnu and Mahishasura-mardini inside a makara torana. Lintels of northern and southern antarala doorway do not show Ganesha but instead shows standing naked-Shiva. This signifies that the western shrine is the main shrine. Tower of the western shrine has four level while those of northern and southern have three level. This shows the dominance of the western shrine indicating that it is the main shrine. All the cells, on west, north and south, share a common rangamandapa. These are connected to it through sukanasi (ante-chamber). The rangamandapa is square and closed hypostyle structure. It has two niches on all sides, thus eight in total. At present most of these are empty, one housing Sapta-matrikas and one broken man-slaying-lion emblem. Four central pillars of this hall are executed in exquisite beauty. These are remarkable for their regularity in size and shape. The central ceiling of the rangamandapa is divided into nine compartment, each containing a flower with central hanging bud. Ceilings of the cardinal points also has flower decoration with handing buds. Entrance is provided from east through a porch which is supported on two pillars and two pilasters. Lintel of the doorjamb of the entrance has Gaja-Lakshmi motif. Instead of single door-jamb, a double door-jamb design is used to make the entrance prominently standing out. There are many icons on the exterior walls of the temple, located above the architrave and on the floors of tower. These icons are the work of more than one artist. The name of few sculptors is engraved on the socle of the sculpture. We find names like Nemoja, Baicoja among the sculptors here. Important icons found here include, Mahishasura-mardini, Adi-Varaha, Shiva as Natesha, Shiva as Somanatha, Ganesha, Ugra-Narasimha, Yoga-Narasimha and Surya. Vasundhara mentions that the main linga now housed in the main shrine is the regular type of tripartite linga where its three parts are separately constructed and joined. However in inscriptions, the god is referred as swambhhu therefore the linga should be made out of single stone. There might be a chance that the present linga is not the original one. There would have been originally an arrangement of Ashta-dikpalas around the external walls of the main shrine, however only Indra and Yama have survived. An interesting figure is of a hunter couple, where the man is shown holding a bow and the female is holding a sword. Vasundhara questions can it be Shiva and Parvati in their kirata (hunters) forms. It appears that the temple is dedicated to dance and music as Shiva as Natesha is present on the sukanasi stele of the northern and southern shrine. Also are seen various dancers and musicians installed all around the temple, on vimana walls and on parapet walls of the porch. The temple was associated to the Kalamukha sect of Shaivism, but was it really dedicated to the dance and music aspect of Shiva and that sect? Kaleshvara or Chikkeshvara Temple – Originally it would have been a triple-celled (trikuta) structure however at present only two shrines have survived. From the ruins it is clear that there was an additional shrine attached to the common mandapa shared by these two shrines. As per inscriptions, it could be Chikkeshvara temple which was built during the reign of the Yadava king Singana in thirteenth century CE. Slab set up against the front wall of the house of Honnappa Byadagai (now in Darwad university museum) – South Indian Inscriptions vol XVIII, no 296 – there are two dates, Saka 1110, corresponding to 1188 CE & Saka 1104, corresponding to 1181 CE – refers to the reign of the Gutta king Vikramaditya II – The record starts with salutation to god Somanatha and continues with details of earth, Jambudvipa and Bharatkshetra. Kuntaladesha located in Aryakhanda of Bharatkshetra is said to be shining as the best part of the lady earth. This Kuntaladesha was ruled by Chalukya family who were united with Kalchuri king Bijjaladeva. After him ruled his brother Maylugi. After Maylugi ruled his younger brother Karnapala. After him ruled the son of Bijjala, Soma. After Soma came his brother Mallugi. After him ruled his younger brother Sankamadeva. After him came Ahavamalla, younger brother of Sankamadeva. Under this Kalchuri king Ahavamalla was ruling his Mahamandaleshvara Joyideva, who was from the Gutta family, tracing their lineage from Chandragupta and Vikramaditya of Ujjaini. The lineage of Joyideva is given from Mallideva, his son Vikramaditya, his son Joma, his younger brother Gutta, his son Vikramaditya (II), his son Joma (II). Joma (II)’s capital town was Guttavolal, present Guttal. His prime minister was Susangamadhava and chief minister was Dasiraja. When asked, Susanga told the king that in the established Shaktiparise, in the most lauded Kittagavi descent of Parvvatavali, appeared the sage Shivalingabratipa with an extraordinary character. His disciple was Vadirudra Panditadeva and his disciple was Kriyashakti. Amrtarashi was the disciple of Kriyashakti and his disciple was Sarveshavaramuni. Kalyanshakti was the disciple of Sarveshvara. Hearing Susanga, king Joma (II) came to see Kalyanashakti and prostrated before him. Kalyanashakti asked the king to build Vikramapura and an adobe to Vikrameshvara at Gottamgadi, on the banks of Tungabhadra. Joyideva (Joma II) gave a tank near Gottamgadi in bada of Honnavatti-12, after making it free from all taxes and annoyances and for the maintenance of Vikrameshvara, Gutteshvara and swambhu Somanathadeva, trikuta temple. It is stated that this grant was caused to be engraved on a copper plate at the instance of Mallugi-Dandanayaka, who was the Desadhikari. This record apparently is a copy of the copper plate referred to above. The second grant made by Dasiraja, the minister of Vikramaditya II, is dated in Saka 1110, corresponding to 1188 CE. It is stated that Dasiraja got a piece of land from Vikramaditya (II) and granted it for the feeding of the ascetics, etc. Record is also made of the grant made by Vikramaditya himself for the merit of his mother Padmaladevi. The recipient of the gifts was Rajaguru Kalyanashakti of the Kalamukha sect and Kittagave-santati. Slab set up against the front wall of the house of Honnappa Byadagi (now in Dharwad university museum) – South Indian Inscriptions vol XVIII, no 295 – refers to the reign of the Gutta king Vikramaditya II – dated in Saka 1110, corresponding 1188 CE – It starts with salutation to God Daseshvara. This inscription refers to Mahamandalesvara Vikramaditya who was born in the family of Vikramaditya of Malwa. This Vikaramditya begot Joma and Gutta as his sons. Gutta with his wife Padmaladevi got Vikramaditya (II). This Vikramaditya (II) was ruling Banavasi from his capital Guttavolal. It states that Dandanayaka Dasiraja, the mahapradhana (prime minister) of Vikramaditya (II) constructed the temple of Daseshvara in the vicinity of the temple of Someshvara at Gottagadi. He also built a matha and a dining hall. Genealogy of Dasiraja is given. It also registers the gift of the village Hosavuru in Kodali in Perbala-70 made by Mahamandalesvara Machirasa. It further registers a gift by Dasiraja, of the village Konanaji in Nolambavadi, which was formerly given to him by Jagadeva-Pandya at the time of his installation (Pattabandhotsava). The grant of the village Kunchigere by Somaladevi and others at the time of the Pattttabandhotsva of Vijaya-Pandyadeva, son of Vodeyarasadeva is also recorded. The recipient of the gifts was Kalyanashaktideva of the Kalamukha sect. Kalyanashakti belonged to Kittagavi santati of Shaktiparise of Parvatavalli. The santati history is provided since Amrtesha, Sarveshvara to Kalyanashakti. Hero-stone on the river bank – South Indian Inscriptions vol XVIII, no 376 – This record dated in Saka 11 (current), corresponding 1206 CE – It states that a hero named Kaleya died in a fight near Anevari, with a certain Pandya, while Rajaguru Kalyanasaktideva was sending his brother Dhruvesvaradeva to Sriparvata. It is also stated that some land was granted in recognition of his valor. Slab set up against the front wall of the house of Honnappa Byadagai – South Indian Inscriptions vol XVIII, no 300 – dated Saka 1136, corresponding 1213 CE – This inscription refers itself to the rule of the Gutta king Ashavaditya Vira-Vikramaditya (II) ruling over Banavasi-12000. The record which gives the detailed genealogy of the Gutta family, says that Vikramaditya II had a sister called Vijayamahadevi who was married to Suryavamshi Singibhupala of Santali-mandala. Their son, Ballala, married Tuluvaladevi, the daughter of Vikramaditya II. It states that Vikramaditya constructed the temple of Tuluvalesvara in the vicinity of the temple of Svayambhu-Somanathadeva at Gottagadi on the western bank of the Tungabhadra, in memory of his daughter Tuluvaladevi who died after giving birth to a son called Bamma. Further it records the grant of the village Guddahalapalli for the worship and offerings to that deity. The recipient of the gift was the Rajaguru Trilochana-Pandita, the Sthanacharya of the god Somanatha. Slab lying in the backyard of Mallappa Banakara (this is not traceable now) – South Indian Inscriptions vol XVIII, no 227 – refers itself to the reign of the Yadava king Simghana but bears no date – This incomplete inscription gives a descriptive genealogy of the Yadava family up to Singana. Yadava family is said to be ruling over Kuntala. Genealogy of Simghana is provided from Mallugi, his son Bhillama, his son Jaitapala, his son Singana. Then comes the mention of Dandanayaka Bica. He was the son of Cikkadeva and Cikkavve. He had two brothers, Mallikarjuna and Singana. Malla had two sons, Cavunda and Reva. Malla and Bica had a sister named Rajale who had adopted the Jain faith. She renovated Vijayajinalaya in Purikaranagara (modern Lakshmeshvar). Bica was governing Beluvala-1200 and Lakshmeshvara. He is said to have routed the Pandyas from the waters of Tungabhadra. Camaladevi was the wife of Bica. The inscription stops here abruptly. A copperplate grant of the Devagiri-Yadava king Singana II – Kalamukha Temples of Karnataka/Journal of the Bombay Branch of Royal Asiatic Society 1882 – this copperplate was found at the back of the temple of goddess Udacamma in 1880 – language Sanskrit, script Nandinagari – It mentions four kings of the Yadava family, Mallugi, Bhillama, Jaitugi and Singana. Dandanayaka Baci is mentioned to serving the southern region of their empire, specially Banavasi. It records foundation of a temple adjacent to the temple of swambhu Somanatha together with the creation of an agrahara (Brahman settlement). The patron was Bicideva, the priest who performed the installation of the deity was Rudrashakti. This is done to discharge his debts towards his parents. Therefore the god is referred as Chikkeshvara, on his father Chikkadeva. It is also told that three lingas were installed and these three lingas are three kings. The main linga is Chikkeshvara however nothing is told about other two. The place of installation is told to be north of the temple of Somanatha. How to Reach – A motor-able road leads from Guttal to Haralhalli which is about 5 km far. Guttal is easily reachable from other main cities like Haveri, Davanagere and Harihar. Guttal has moderate options for accommodation and food. Haveri is the nearest railway head which is about 33 km far. Burgess, J (1885). Lists of the Antiquarian Remains in the Bombay Presidency. Government Central Press. Bombay. Campbell, J M (1884). Gazetteer of Bombay Presidency vol 22: Dharwar. Government Central Press. Bombay. Cousens, Henry (1926). The Chalukyan Architecture of the Kanarese Districts. Archaeological Survey of India. New Delhi. Palande, M R (1959). Dharwad District Gazetteer. Karnataka Government Press.